A manhunt is underway for Allen Warner, the husband of a woman who was shot and killed in Marshfield, Massachusetts. A woman who was shot Monday in Marshfield, Massachusetts, has died, authorities confirmed. Plymouth County District Attorney Timothy Cruz announced Monday night that the woman had called 911 shortly before 6 p.m. to report that her soon-to-be-ex husband was chasing her in a car. When police responded, they found the victim with injuries to her face. The woman was taken to South Shore Hospital, where she was pronounced dead. 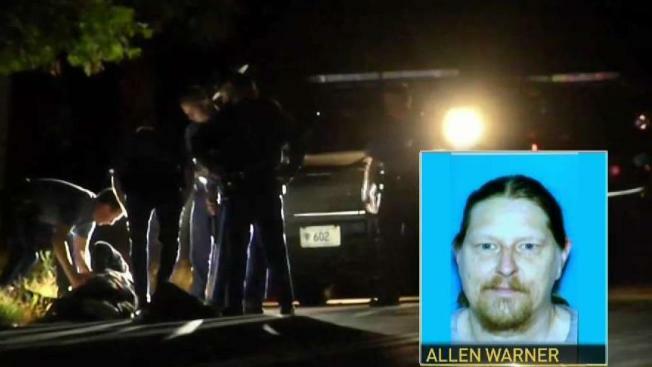 Massachusetts State Police, local police and a SWAT team took part in a manhunt for the victim's husband, 47-year-old Allen Warner, who is being considered a person of interest. Authorities believe Warner is driving a gray 2013 Toyota Corolla with Massachusetts plates reading "4FSZ80." Warner is considered armed and dangerous, and authorities are asking people not to approach him if they see him or his car. Police are urging residents in the area to stay inside and to lock their doors while they search for a suspect. At one point earlier in the evening, police ran after a man, handcuffed him and searched him. After speaking with him, they let him go and continued searching for the suspect. Route 3A and surrounding roadways were closed, according to Patrick Marvin of the Massachusetts Department of Transportation. Duxbury Athletics announced on Twitter that its volleyball team was in lockdown in Marshfield High School, but it later said the team had been released and was on its way back to Duxbury. Police in Marshfield said around 8:30 p.m. that the high school had been completely cleared.